To lock the doors from the inside, simply close the door and push the lock switch to the "LOCK" position. o When the door is locked, the red mark on the switch is not visible. 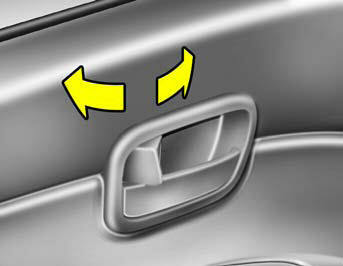 o The driver's door can be opened by pulling the inside door handle even if the inside lock switch is pushed to the "LOCK" position. Be careful not to pull the inside door handle while driving. If you pull the inside door handle, the door can be opened and you may be ejected from the vehicle and can be injured or killed.